The last month of the year always sees a slowing of the property market and fore-shadows the quiet month of January before the market bounces back for the key summer months of February and March. This year the trend witnessed in the past few months continues, with weak sales volume across all property types down 2% compared to last year with just 58 sales in the final quarter of the year. The recovery in sales volumes in November seems to have failed to sustain and we appear to be stuck back in a quiet market. What is significant though is the weakness in inventory, which finished the year with just 32 properties of all types on the market, such slim pickings for buyers is clearly the key behind the strength in sales prices, which for all property types across Devonport saw a 18% rise against last year at just over $1.6m. The market for units appears to be fairing slightly worse than for house sales, where the sales volumes have eased significantly over the past 6 months after what was a sustained period of strong sales growth - peaking with a 62% year-on-year growth back in May. 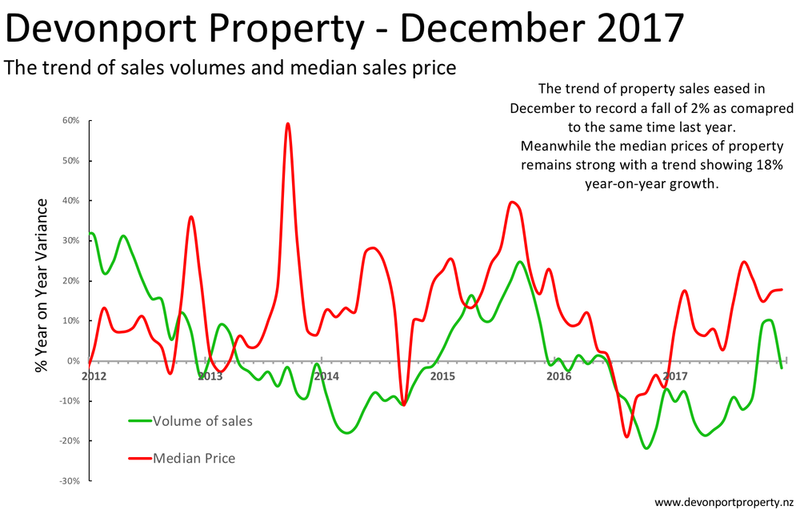 As the volume growth has come off, so has to some extent the median price, which was showing strong growth of around 20+% through much of 2016 into 2017, but has slowed to a much lower rate of growth and turned down into a decline in prices in the second half of 2017.